It may be Christmas in July for online shoppers, but bargain-hunting investors may be out of luck. Whether they are searching for stocks or bonds, there simply aren't many doorbuster discounts to be had. After all, many stocks are trading at all-time highs. But bonds too are trading at expensive or very expensive levels compared with their historical norms, according to a BlackRock analysis. For example, the above chart shows that U.S. Treasurys are valued at a level equal to or greater than 94% of their history. It's even higher for German bunds, which are trading at levels unseen in 99% of their history. Talk about pricey. Those aren't exactly the kind of deals you'd find on Amazon.com (AMZN) and Wamart (WMT), the retail giants that are embarking on an online price war this week. "Absolute bargains are hard to find," said Russ Koesterich, global chief investment strategist at BlackRock. Stocks look like the better deal: However, BlackRock's analysis does suggest investors can still get discounts on a relative basis. 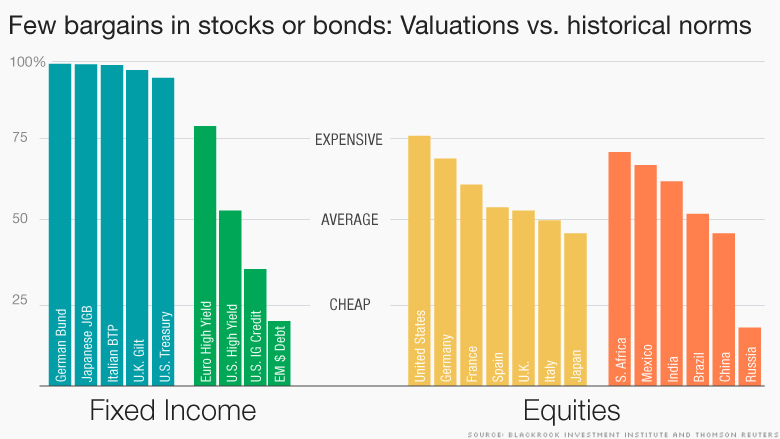 U.S. stocks are pricey -- but not nearly as expensive as bonds. American equities are trading at 73% of their historical norms, which almost looks cheap compared with bonds. Stocks in Germany, France, Japan are even less expensive. Even emerging market stocks, which tend to be faster growing but more volatile, are valued at more affordable levels than bonds. "The conclusion for investors is equities still appear to be the better bargain," said Koesterich. Rate hike looms: Investors need to beware of the Federal Reserve. Thanks to the improving economy (Tuesday's disappointing retail sales report aside), the central bank may raise interest rates later this year. A rate hike will make bonds look less attractive. On the other hand, stronger economic growth could boost stocks by lifting corporate profits. "We believe that this improving economic backdrop, along with rising earnings estimate revision ratios, will provide a tailwind for stocks," Bank of America Merrill Lynch wrote in a report on Tuesday. BofA did warn that lofty valuations "will likely limit the upside" to stock market gains. Don't be scared to go overseas: That means investors may need to be even more selective during the second half of the year -- including considering international equities. "Given where valuations are, I think investors need to be more creative, more willing to go abroad," Koesterich said. BlackRock is a fan of stocks in Europe and Asia, though neither region is without their issues. Europe is still dealing with the Greek crisis. However, there is reason to hope the worst may be over following a bailout deal reached Monday. Moreover, stocks in Germany -- Europe's economic powerhouse -- are a bit less expensive than in the U.S. Riskier economies like Spain and Italy are even cheaper. Despite the turmoil in China's stock market, BlackRock also likes Asian equities, especially in Japan. The country's stock market has benefited from increased equity purchases by pension funds as well as easy money from the Bank of Japan. It also trades at just 28% of its historical norms, compared with 73% in the U.S.
Banks could cash in on higher rates: But many investors would prefer to bet on the world's largest economy. BlackRock's preference in the U.S. is for technology, financial and healthcare stocks because all three should be able to withstand higher interest rates. In fact, a rate hike should actually help banks like Bank of America (BAC) by boosting net interest income, or the difference between interest paid out on deposits and interest earned on loans.